I have half a dozen handwritten recipe cards I've collected over the years. They're all from dear friends, and I love seeing their handwriting every time I make their tasty dish. I think of them affectionately. It's so much better than a page printed off the internet or a recipe displayed on a screen. If you want someone to think of you fondly years from now, write out that recipe by hand! 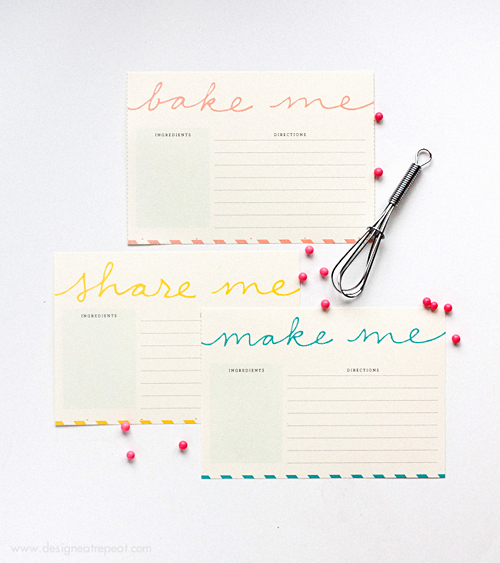 These cute, free printable recipe cards from Design Eat Repeat will help you out. Very cute cards! I'm going to send one out to each dear friend and ask them to write up their favourite recipe. Wondering if these are a 3x5 size or 4x6 before I print them?